How do I turn the report emails I receive from Triptease on or off? There are a range of report emails you can receive from Triptease to stay on top of things like your parity, unusual spikes in your disparities and your overall performance. You can sign up for these - or switch them off - by clicking on Account in the left hand menu, then Your profile and then Notifications. From here you can control whether or not you receive your Triptease achievement emails, monthly summary email, your automated assistant summary email and also change the number like to have SMS messages sent to when a new guests has started a chat conversation. This is also where you can set the regularity with which you receive parity reports (either daily or weekly) and set the threshold at which you’ll receive surge alert emails if there’s an unusually high disparity rate for your hotel. You can also switch either or both of these emails off completely if you like. 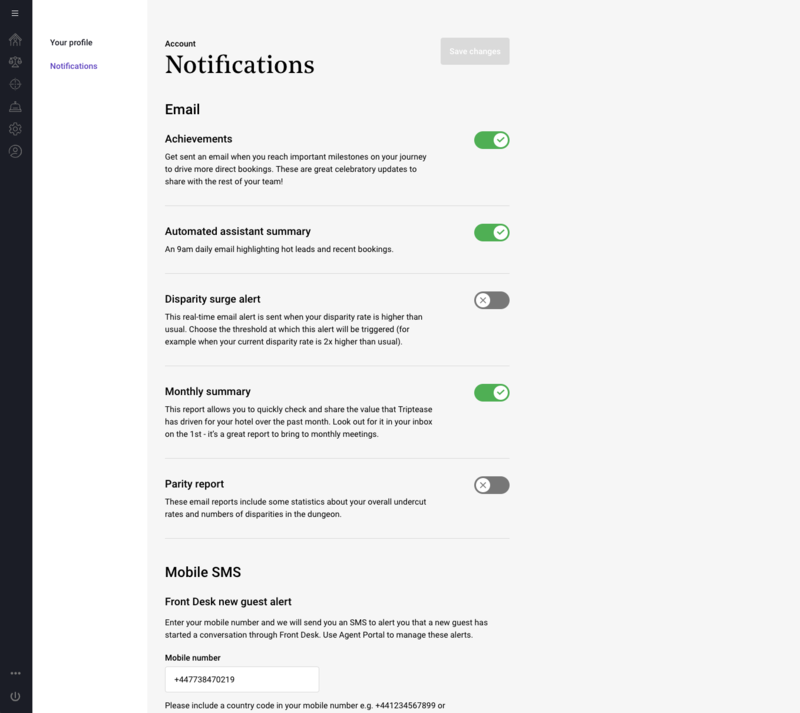 You can switch off any email or alert by simply clicking the on/off toggle next to the relevant email.